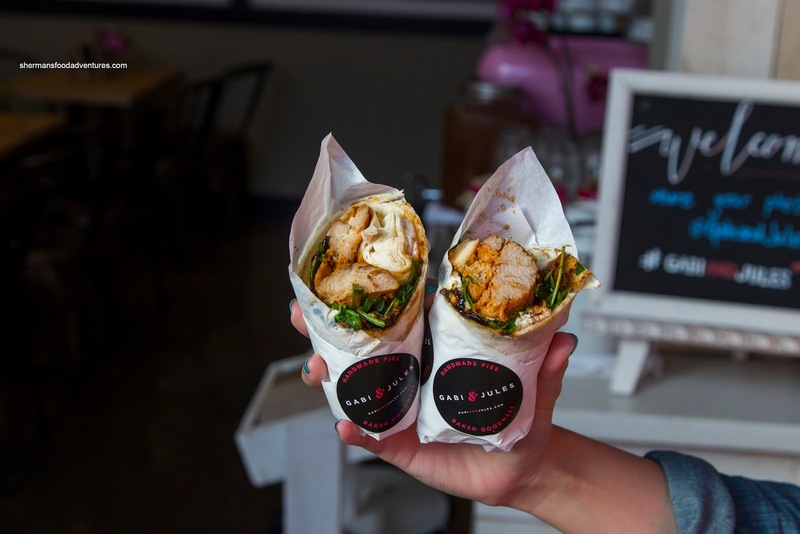 Once upon a time, the only thing worth driving out for in Port Moody was the awesome rotis from Rehannah's (Don't say Rosa's because I find it meh...). Then there was Cake-Ya and a few more in and around Newport Village. Oh and let's not forget Rocky Point Ice Cream... With more and more people moving out to the once sleepy (and still is in some ways) PoMo, we are beginning to see some life in the culinary scene. 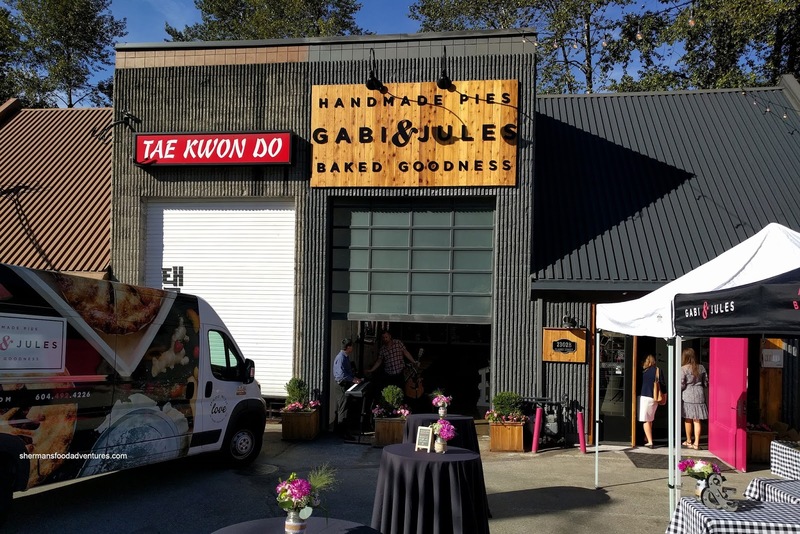 The newest is Gabi & Jules featuring their awesome pies (yes, I gave away the verdict, but they are very good!). Before I got to the pies, I did begrudgingly (because I really wanted some pie!) tried some of their sammies including the Pollo Capra Wrap. Well, I have to admit this was pretty good with layers of flavour including the sweet onion marmalade and mildly pungent goat cheese. Nestled within were tender and moist nuggets of roast chicken and arugula. 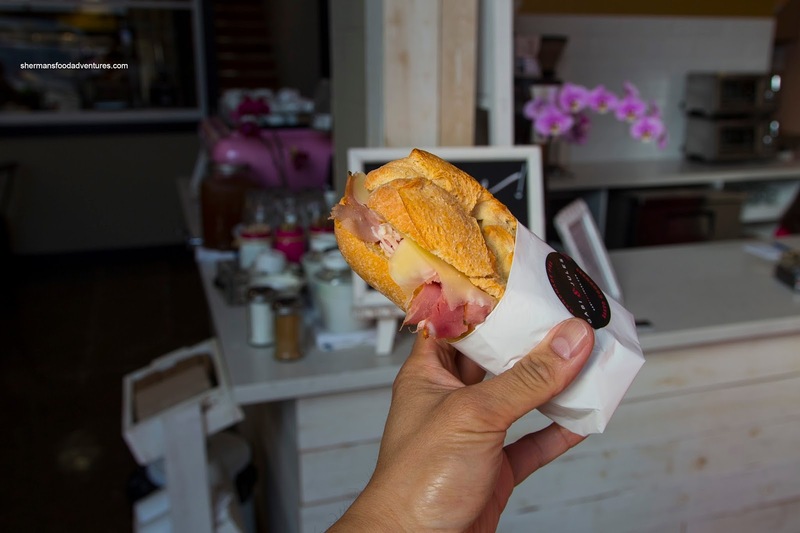 Exhibiting impactful flavours from the saltiness of the prosciutto cotto, the Mont Blanc Sandwich suffered from an overly dense and hard bun. Too bad really as the tart Dijon and Swiss cheese added both extra flavour and textures. Moving away from the sammies, I went right for the pies when they became available. I had the Strawberry Ginger Peach first which was full of flavour. There was no sissy amount of ginger as it was apparent with a slightly spicy bite. 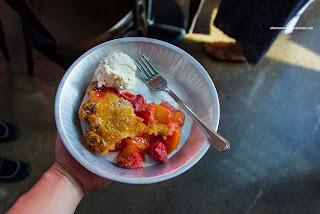 However, it wasn't overwhelming since the tart and plump strawberries stood out as well as the tender slices of sweet peaches. As a whole, the filling wasn't too sugary. The scoop of Rocky Point Ice Cream provided a nice balance as well as creaminess to the pie. 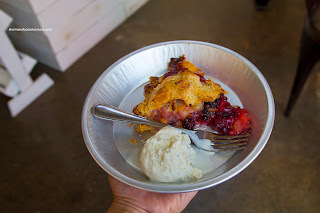 Next up was the Blackberry Apple Pie which featured a nice tartness from the blackberries. The apple slices were tender and mildly sweet. I liked how the crust stayed firm and crunchy from top to bottom. It wasn't overly buttery which I personally prefer. Tying the Strawberry Ginger Peach as my favourite was the Traditional Apple since it was full of tender slices that were not inundated with too much sugar (much like the other pies). However, that didn't mean there wasn't any impact though as there was a slight kick of cinnamon as well as a touch of tartness. Again, the firmly crunchy crust added a textural contrast that was just right. One of the more mildly-flavoured pies was the Blueberry Nectarine as it was neither tart nor sweet. 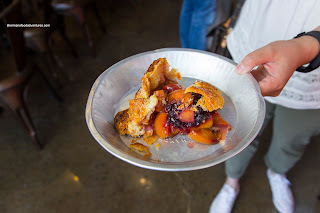 I liked the nectarine slices as they were tender while still maintaining a bite, but the pie lacked impact. It really needed a scoop of ice cream to add the necessary sweetness. 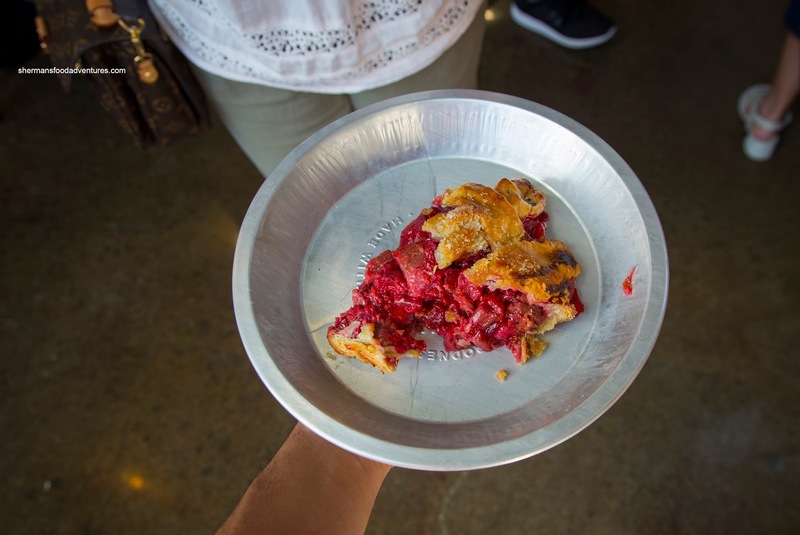 On the other hand, the Raspberry Rhubarb was plenty tart all around. I like tangy-flavoured food, so this was appealing with large chunks of rhubarb mixed in with lots of raspberries. Again, the crust stayed crispy and flaky despite the wet ingredients. 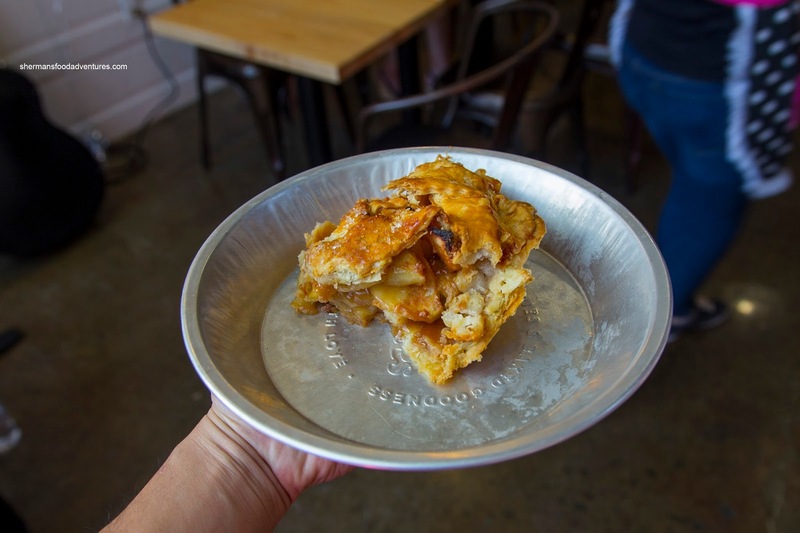 I realize some might want more butteriness, but for me, the drier crust ensured that there would be no soggy parts. I'm definitely returning for some more pie and a scoop of Rocky Point ice cream on the side!